Today I'm sharing a box that I made for my daughter to store her 'stuff'. When your daughter asks you to make her a box for 'stuff'... you make one LOL. This large mache box is made by DCC, but you can find similar ones in any craft store. Here are the basic steps to making this box. I didn't take step-by-step photos, but you can get the idea by looking at the finished project. It's simple! To begin, I painted a thin, uneven coat of white gesso to the outside surface of the box. This helps give the box a distressed look and the ink colors stay true to color because the box is naturally a kraft brown. Once the gesso dried I adhered a few strips of tissue tape around the edge of the lid. Using Ceramic Stucco by Liquitex, my favorite medium for adding texture, I created a harlequin pattern in random areas with the help of a stencil by the Crafters Workshop. Next comes the chipboard! For the bottom border of the box I used two packs of the French Flourish Border (DA0275) by the Dusty Attic. The chipboard words used for this project all come in one pack - DA1170 Live Beautifully and can be purchased HERE. Because the box is round, here's a tip on how to adhere the chipboard to the sides. Lay each piece flat and spritz a very light mist of water onto each chippie. Allow the water to soak in a few seconds. This will soften the chipboard enough for you to conform it to the curves of the box. Do not let the bottom of the chipboard get wet or it may be difficult for the glue to adhere. After the glue dries, brush a thin, dry layer of gesso to each chipboard piece the same way we did to the surface of the box. The goal is to have almost no product on your brush otherwise it will seep into the gaps of the chipboard designs. Once the Ceramic Stucco is nearly dry, it's time to ink it up! Choose your favorite spray inks and go crazy! Well, artistically crazy LOL. There's really no method that I use for this. I randomly spray the colors in different areas to my liking. Finally, once the ink was completely dry, I used the Reflections stamp by Stampers Anonymous and lightly stamped the pattern all around. Below are a few more close-ups of the side of the box. The lid was really fun to make! Most of the flowers were hand-made with the exception of the dark purple and hot pink mulberry flowers and the white flowers by Prima. The round lid of the box was the perfect match for this Skeleton Clock Face (DA0430) design. I used the same process as I did with the side of the box. The purple chipboard design that was used to accent my flowers is called Wattle Blossoms (DA0752). The flowers that have a script pattern on them were made by hand. They were cut from Donna Salazar's Bitty Blossoms and Rose Creations dies by Spellbinders. 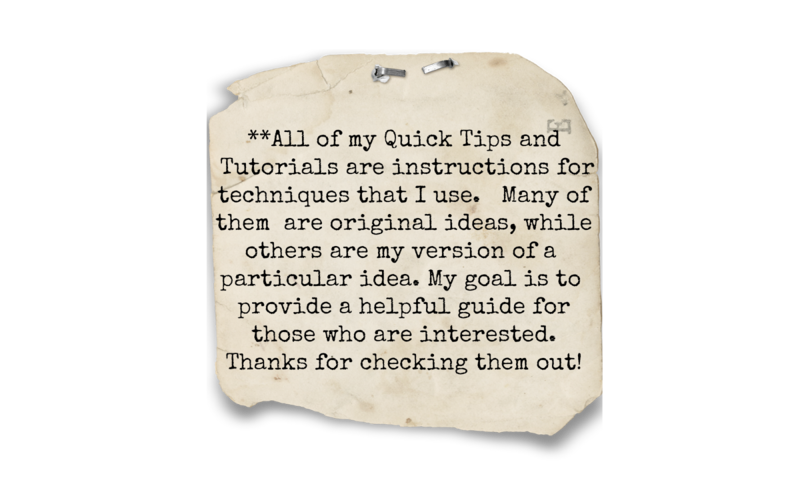 Below is a tip on how I added the script to my flowers. I generally like to use watercolor paper to make my flowers when I don't have any patterned paper that matches my color theme. To add an interesting touch, I adhered strips of patterned tissue tape to the watercolor paper like this. Then spray your favorite ink colors to the paper. Spritzing water on top of the ink will give it a nice gradient effect. Let it dry and then cut your flower layers! "She is proof that you can walk through hell and still be an angel." Before I get into my project details I would like to share a quick background as to how this piece came about and why it is significant to me. For this project I used an 11"x14" stretch linen canvas that I purchased from Michaels. I was immediately drawn to the linen surface when I saw it and I LOVE that it is not white. 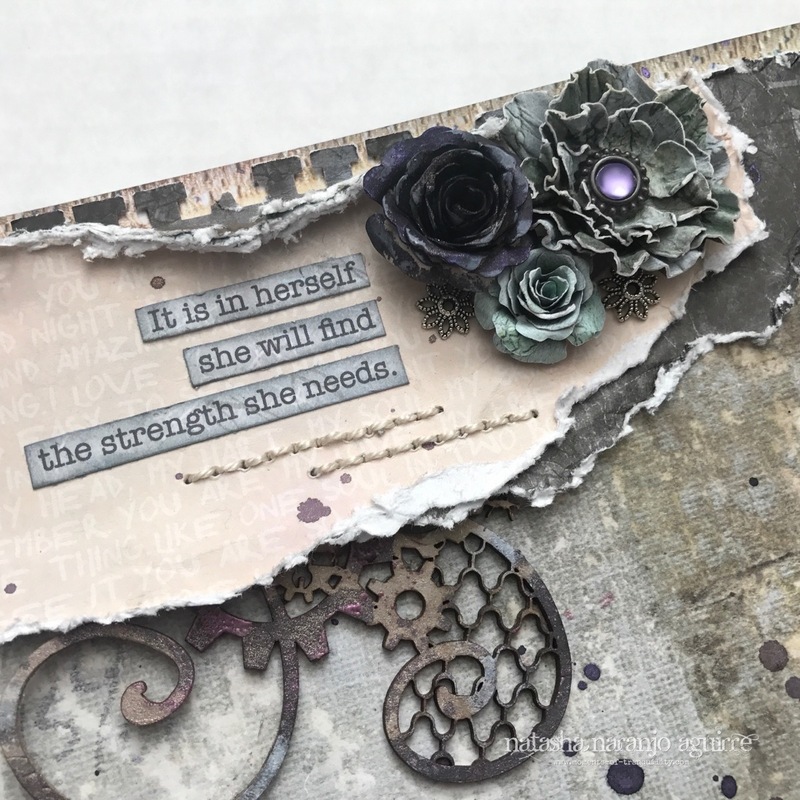 To add texture to my canvas I used Ceramic Stucco by Liquitex and the Mini Bricks stencil by The Crafter's Workshop to create the brick background. Once the medium was dry, I applied several different Distress Inks to achieve the desired color. The upper right portion of this canvas represents the 'light' within the angel... the goodness. All of the flowers were made by hand using paper from various collections by Pion Design. The smaller flowers were cut from Bitty Blossoms dies and the larger flowers were cut using Rose Creations dies, both by Donna Salazar. 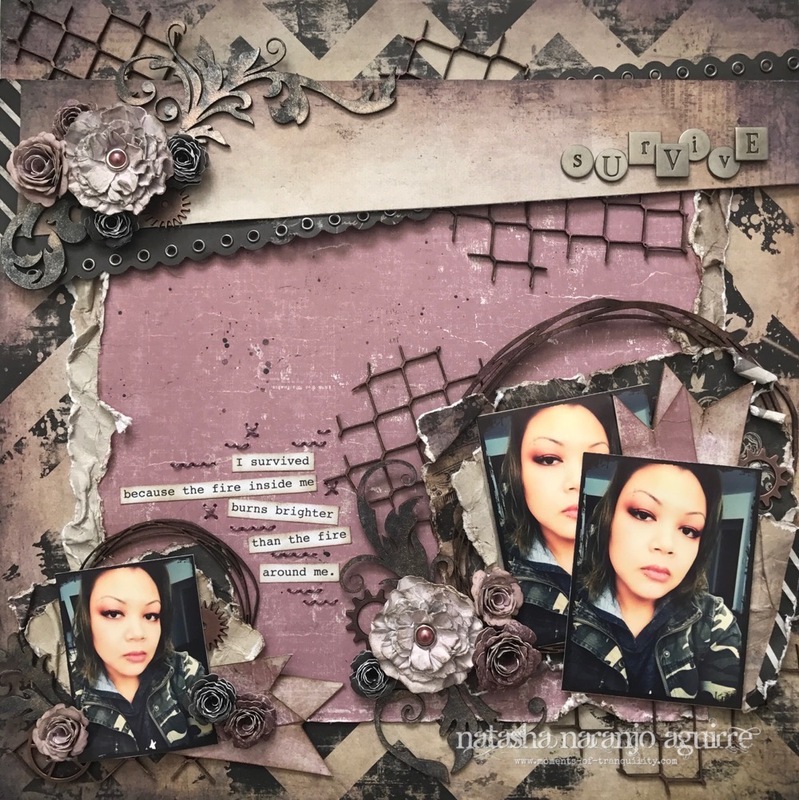 The chipboard flourishes, DA0848 Floral Corners and DA0628 Corner Flourish #1, were inked with Tawny Turquoise by Lindy's Stamp Gang. The color changes from turquoise to brown, depending on the angle at which you look at the flourishes. Behind the flowers is a layer of Girlie Grunge Gauze by Donna Salazar. I love the texture of this material and the way it absorbs color. This gorgeous tree by The Dusty Attic, DA0091 Bare Tree #2, was first inked with Walnut Stain Distress Ink, and then parts of the surface were spritzed with Dark Chocolate Truffle by LSG. This resulted in different tones (light and dark) of brown and helped to give the tree a bit of dimension. To create an old, distressed look, I embossed random areas using Distress Embossing Powder by Ranger. Love the rough texture that this gave the tree. The Mini Birds were inked with black ink, and I swiped the thinnest layer of white paint across the surface using my finger so that the birds didn't appear so 'flat'. Each piece was inked with a variety of brown and black ink, and the flourishes were sprayed with a coppery red ink to mimic the color of flames. The reason I added a few flowers from the corner of 'light' is because I wanted to show that the 'angel' leaves behind traces of her goodness despite her presence in the 'darkness'. The 'angel' (DA0657 Divine Divas) was sprayed with the same ink used in the upper right corner, Tawny Turquoise. Her skirt is made from the Girlie Grunge Gauze I used in the background as well as bits of lace and ribbon scraps. The wings were dampened with water and split apart to create more of a 3D effect. They were also embossed with two different embossing powders by Lindy's Stamp Gang - Angel Wings Jade and Magic Moon Pearls. 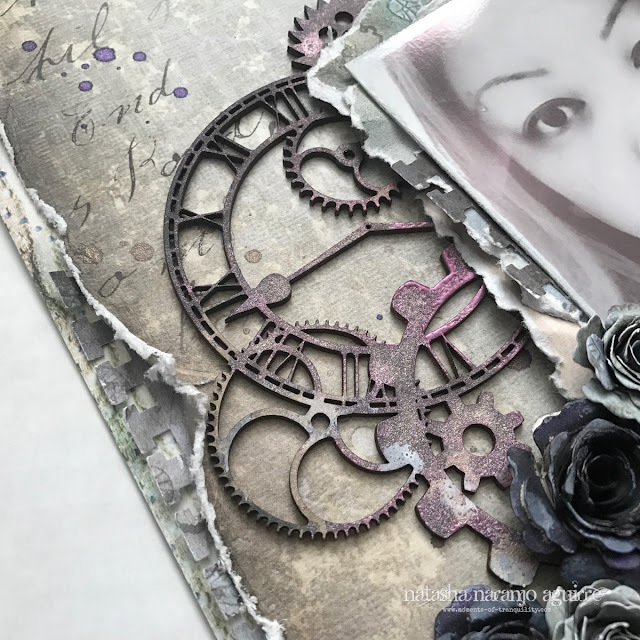 The chipboard cogs (DA0001 Cogs #1) represent the turmoil felt within which is why I used both the turquoise and coppery red colors to color them. I hope you like how this piece turned out. It was a pleasure to work on. 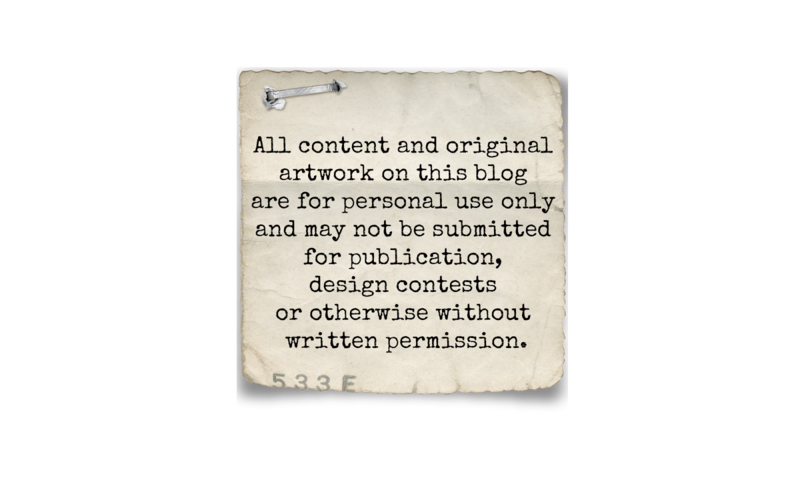 All of the chipboard designs used for this canvas can be purchased HERE. If any are out of stock you can special-order them HERE. Thanks for taking the time to stop by. Hope to see you again next time!